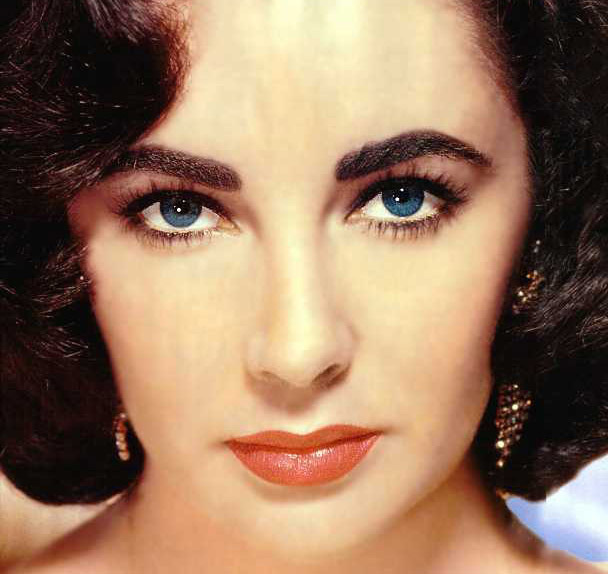 How many husbands did the beautiful Elizabeth Taylor have? And what does this have to do with renewing the Catholic Church? Hang on, there is a connection. There’s nothing wrong with knowing trivia about movie stars. 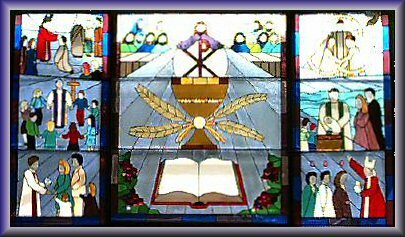 However, with the number seven in mind, can you name the seven sacraments? This image should help. I think most Catholics can pass that test. Still it might be interesting to see whether we know more about Elizabeth Taylor or Charlie Sheen or the Kardashian Sisters than we do about our faith. Now, take a moment and see if you can name 12 players on your favorite team. 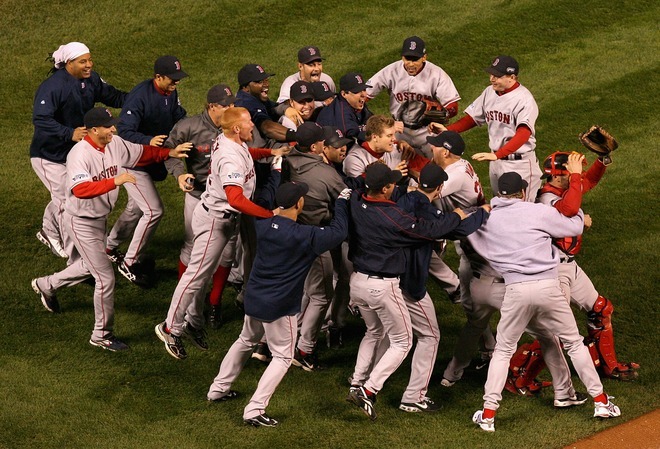 Let’s say you are a Red Sox fan. Can you name a dozen from the 2004 or 2007 World Championship rosters? Did 12 names come to mind? Great, now name the 12 Apostles. So what matters to me more, baseball or God? Well, someone watching me get upset over a blown lead during a spring training game, might say baseball. But truly, I know that without faith my life has no meaning. So I guess this means I have to do better. I have to learn those Apostles’ names. And I have to devote more time and interest regarding my beloved faith. So here is one more question. If you had a chance to go to a day spa or play golf all day for only $25 or $30 would you? 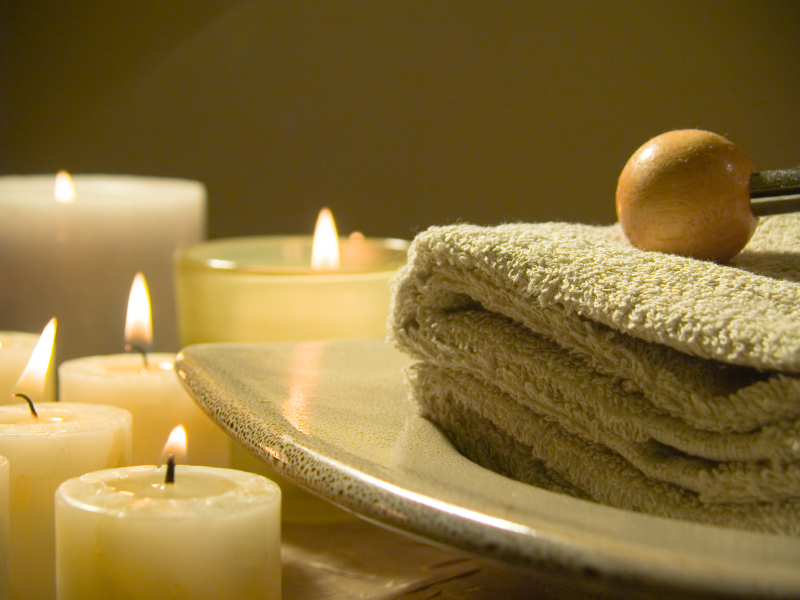 Well, the Diocese of Springfield is offering two great chances to go to a spiritual spa. The Catholic Men’s Conference is next Saturday, April 2. 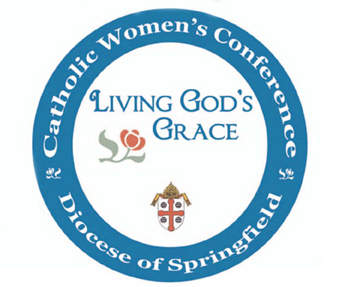 And the Catholic Women’s Conference is Saturday, April 16. Both offer a chance for great spiritual renewal. Sister Olga of the Eucharist will be talking about “Zeal for Our Faith” and how we can help renew our church at the women’s event. This is a great chance to show that our faith matters to us as much as news about Elizabeth Taylor. Now do you get the connection? So call 452-0811 for the men’s conference or 452-0812 for the women’s conference. Make a commitment and show the world that our faith is alive and well. 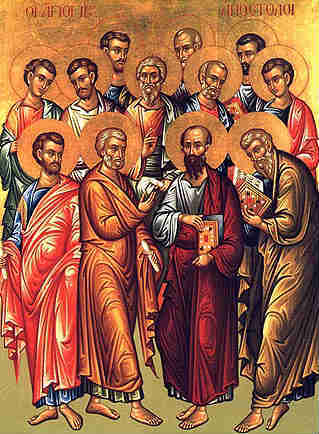 The names of the 12 Apostles of Jesus are, Simon Peter, James, John, Andrew, Philip, Thomas, Bartholomew, Matthew, James, Judas, Simon Zelotes and Judas Iscariot. And Charity Mathias made an important observationwhen she wrote: ” Dear Peggy What about the apostle Matthias who took the place of Judas!” She’s right! Sorry we forgot to list him! Yellow ribbons were everywhere as our preschoolers welcomed home a very special visitor, U.S. Army Specialist Andrew Menard, straight from Afghanistan! Our children have been corresponding with him while he was deployed sending cards, pictures and supplies to him and his fellow troops. 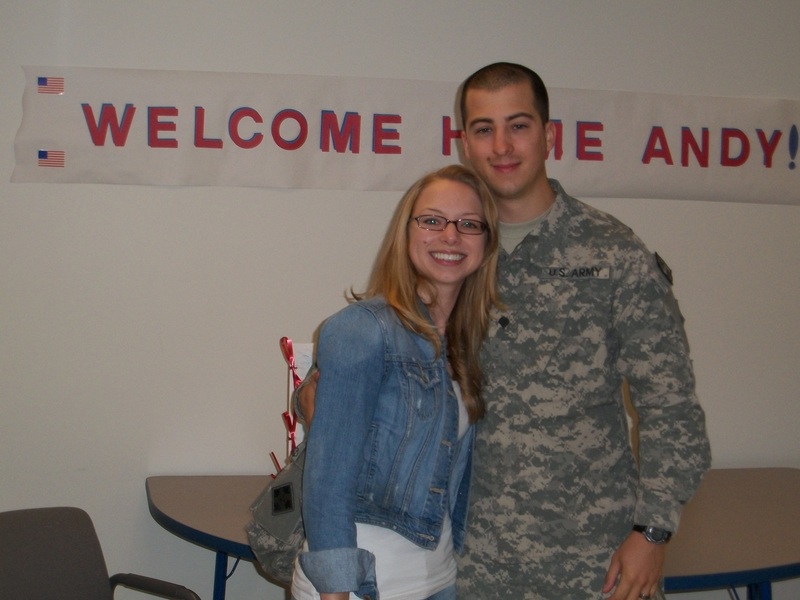 Specialist Menard is home for a few weeks to visit with family before he is deployed once again to Afghanistan. It was a very moving morning as the children saw in person the young man whose picture sits on the prayer tables of each classroom next to the image of St. Michael, our Academy’s patron saint. 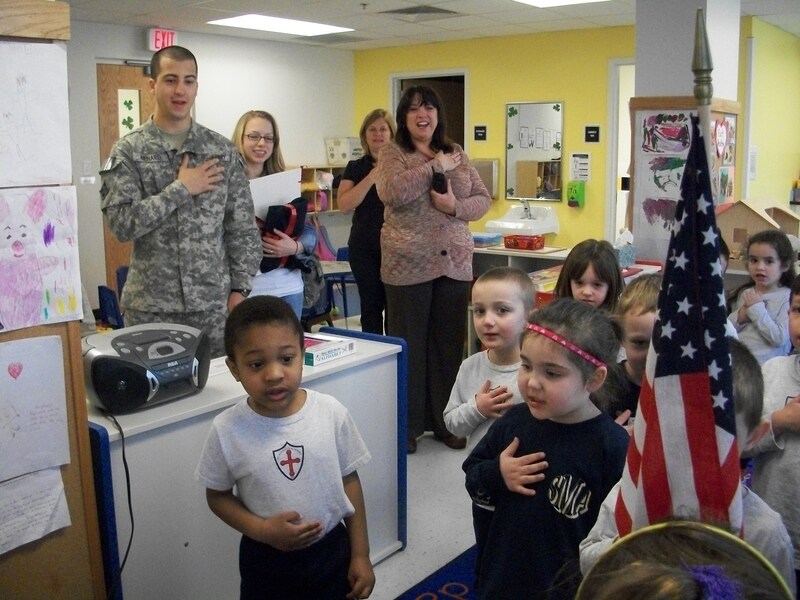 The children saluted him as he joined them in the reciting of the Pledge of Allegiance to the Flag. Spc. Menard, a native of Agawam, left the school with a warm goodbye as well as an SMA sweat shirt and Saint Michael medal. “We were thrilled to have the opportunity to show our hero how much we appreciate his service,” said Joanne Powers, Lead Teacher at the preschool. 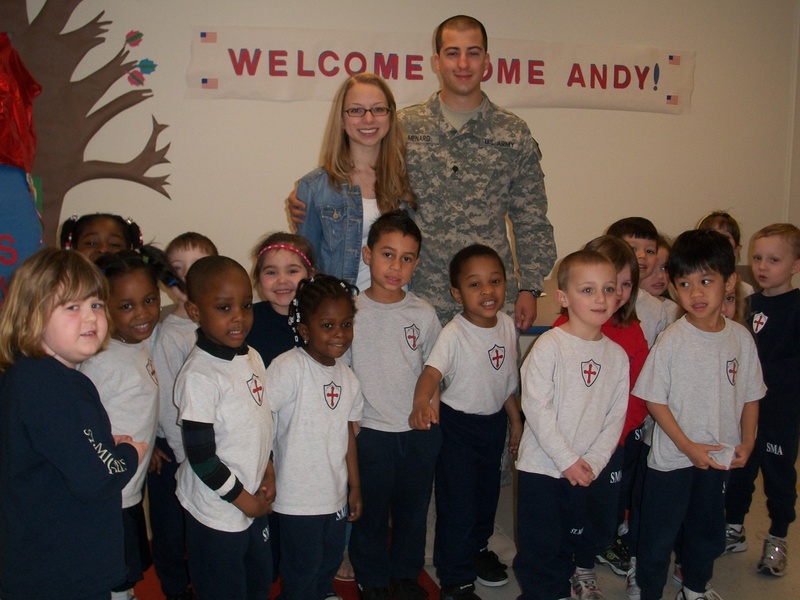 The children will continue to pray for the protection and safe return of Andrew and his fellow troops. May God bless you, Specialist Andrew Menard, and may St. Michael defend you in battle! Andrew is the husband of Brigette Menard, one of our wonderful staff members here at St. Michael’s Academy Preschool Discovery Campus. 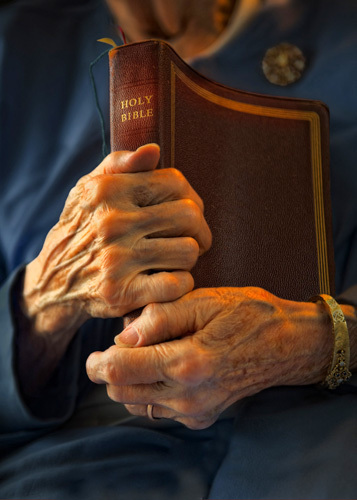 On childhood visits to my Methodist grandmother, I often saw her read the Bible to understand how God was speaking to her. From it she drew inspiration and guidance for life. 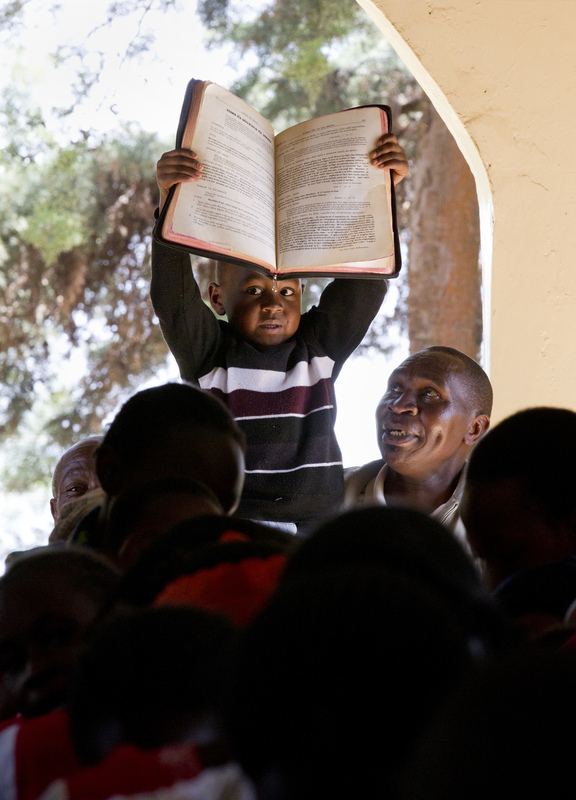 It was encouraging to see that despite our different churches, we shared the Bible in common. Back then, however, despite her example, I was not moved to read the Bible myself. Like many Catholics, I got my dose of the Scriptures at Sunday Mass. Reading the Bible has since become a valued part of my life. How about you? The Bible is the world’s best bestseller. Not only is it God’s inspired Word, it’s a great work of literature. It’s a collection of books composed over many centuries, with many literary forms, including history, historical novels, parables, allegories, and poems. It tells a tale that stretches back to the creation of the world and forward to the end of time. 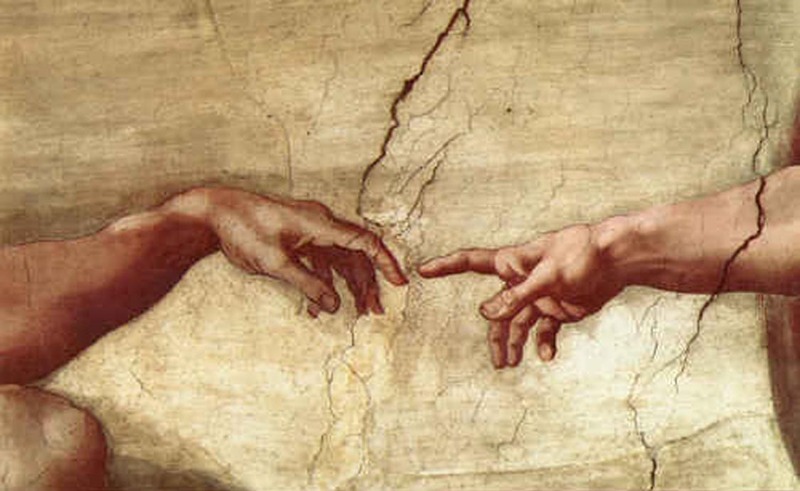 It speaks of faith, hope, love and forgiveness, describes every human emotion, depicts the heights and depths of human courage and depravity, and above all God’s unconditional love for humanity and his salvific plan. 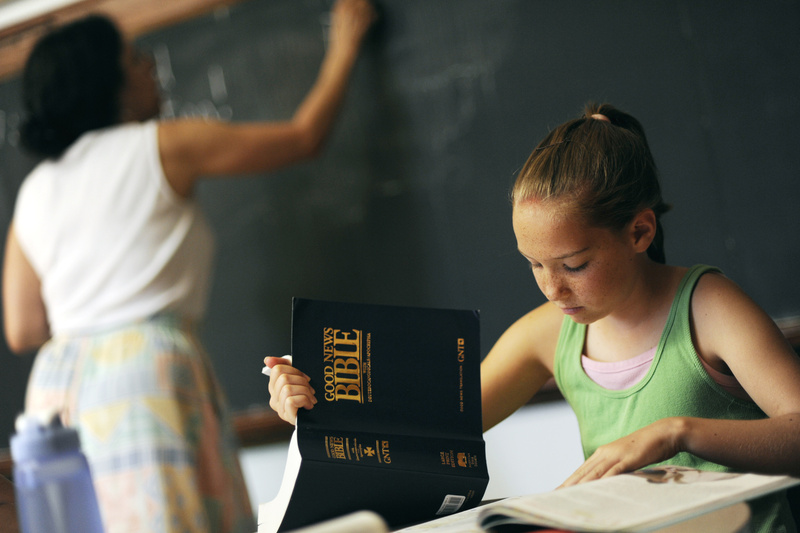 There are numerous reasons to read the Scriptures. 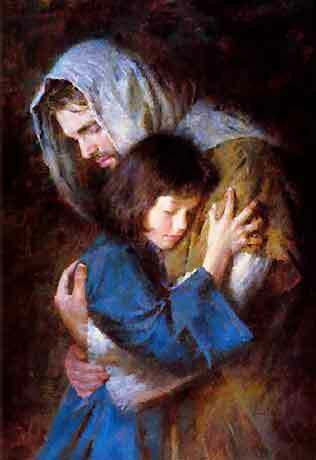 2: It chronicles for us God’s loving plan of salvation for all. 3: Because the New Testament is hidden in the Old, and the Old is made manifest in the New. 4: Ignorance of the Scriptures is ignorance of Christ. 5: Scripture is a deep font for the Church’s worship and prayer life. 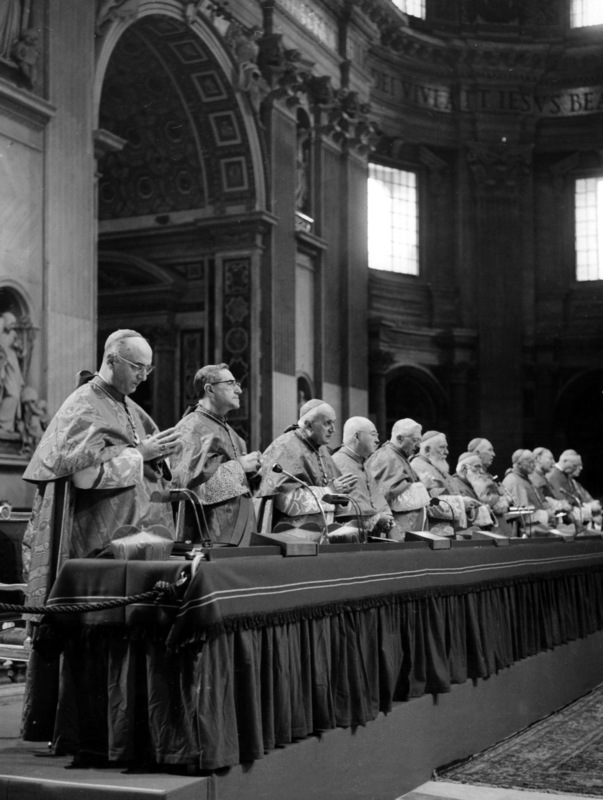 Since the Second Vatican Council, the Church has provided for an expanded use of Sacred Scriptures in the Liturgy of the Word at Mass, in the celebration of the other sacraments and the devotional life of the Church, and in its urgings to the laity to celebrate Morning and Evening Prayer which incorporates recitation of the Psalms. 6: It continues to instruct the faithful and call them to faithfulness in their covenant with God. 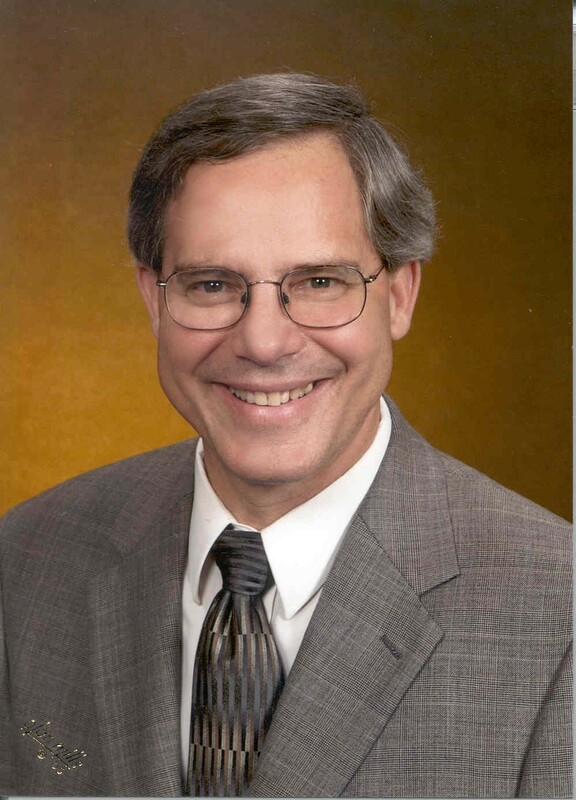 Michael Steier, D.Min. is Associate Director Secretariat of Evangelization and Catechesis of the United States Conference of Catholic Bishops. Editor’s note: A newly revised Bible was placed on bookstore shelves on Ash Wednesday across the United States. This is the first update in 40 years. 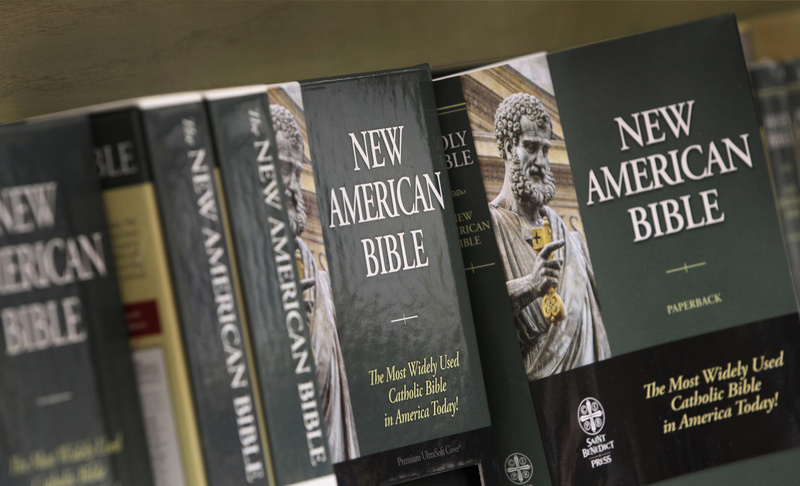 The United States Conference of Catholic Bishops has offered a series of articles about the change and about the Bible. This is the first essay, more will follow. Walk into any bookstore and you’ll see entire shelves of Bibles. 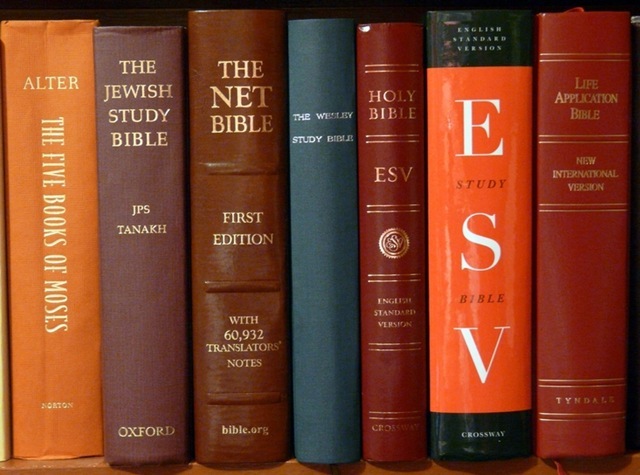 Type “Bible” into the search engine on an online bookseller, and you’ll get more than a quarter of a million results! Does it matter which one you buy? How can you tell which one is right for you? 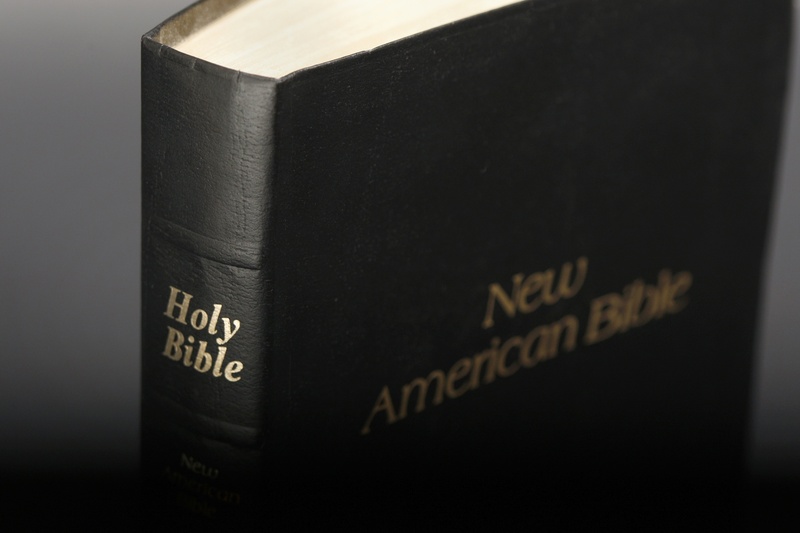 The first step in selecting a Bible translation is making sure that you have a Catholic edition. Catholic editions include seven books of the Old Testament (Tobit, Judith, 1 and 2 Maccabees, Wisdom, the Wisdom of Ben Sira, and Baruch) and the additions to two other books (Esther and Daniel) that are not found in many Protestant editions of the Bible. 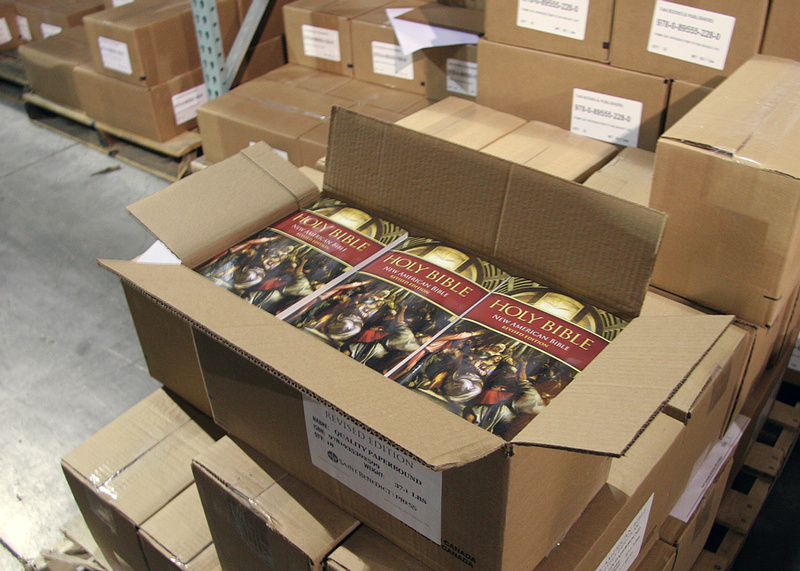 The Church believes these books are part of the canon of Scripture, inspired by the Holy Spirit. In a Catholic Bible, these books are printed as part of the Old Testament. In some other Bibles, these books (and sometimes additional, non-Scriptural books) are printed between the Old and New Testaments. 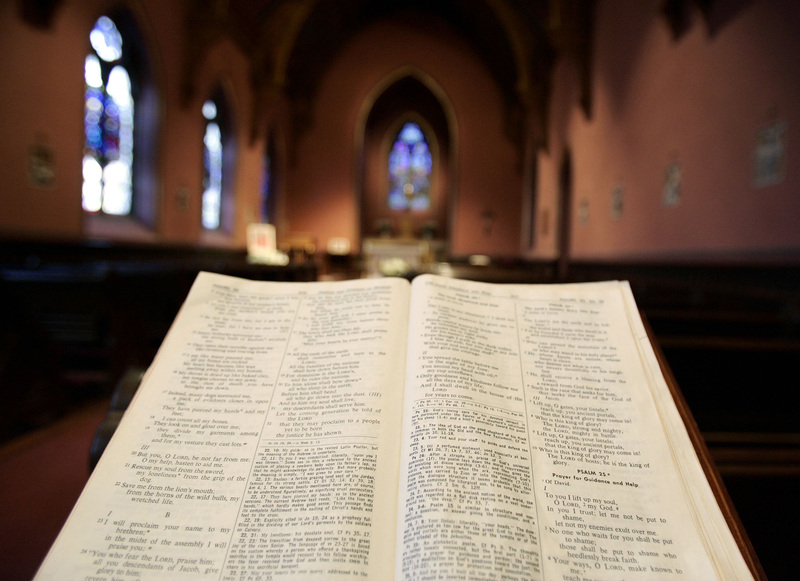 To be used for teaching or private reading, a Catholic Bible should have an imprimatur or canonical rescript. This official notice is usually printed on the back of the title page. 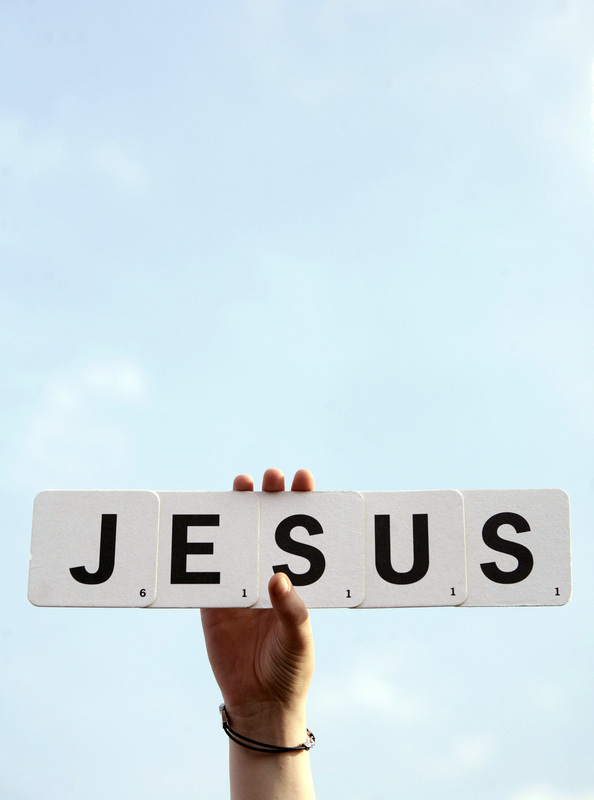 Latin for “let it be printed,” the imprimatur indicates that Church authorities have reviewed the text and found that nothing in it is contrary to the doctrine and morals of the Church. It does not necessarily mean that all the experts and bishops involved in the review agree with every decision made by the translators. It simply means that the text of Scripture is translated accurately and that nothing included in the text or notes is contrary to the teaching of the Church. A canonical rescript expresses a similar judgment. You will also want to decide what style of translation you find most useful. A formal equivalent translation will render the text more literally (word for word), keeping as close as possible to the language and structure of the original while remaining readable in the modern language. A dynamic equivalent translation is less literal, conveying the overall meaning of the original text in the modern language (thought for thought) without necessarily following the language or structure. A paraphrase retells the original text in the writer’s own words. This style is used most frequently in Bible story books intended for children. 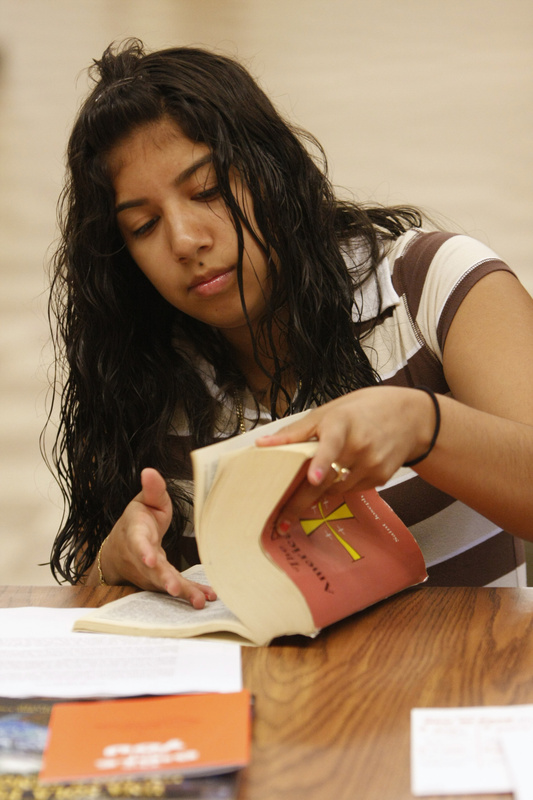 A Catholic translation will also have notes and annotations to help you understand the text. These notes may provide alternate readings of passages that are unclear in the original, help in understanding plays on words that depend on knowing the original language, and brief explanations of how the Church has interpreted the passage. Once you have picked a translation, look for features that will meet your personal needs, including price, size, and format. 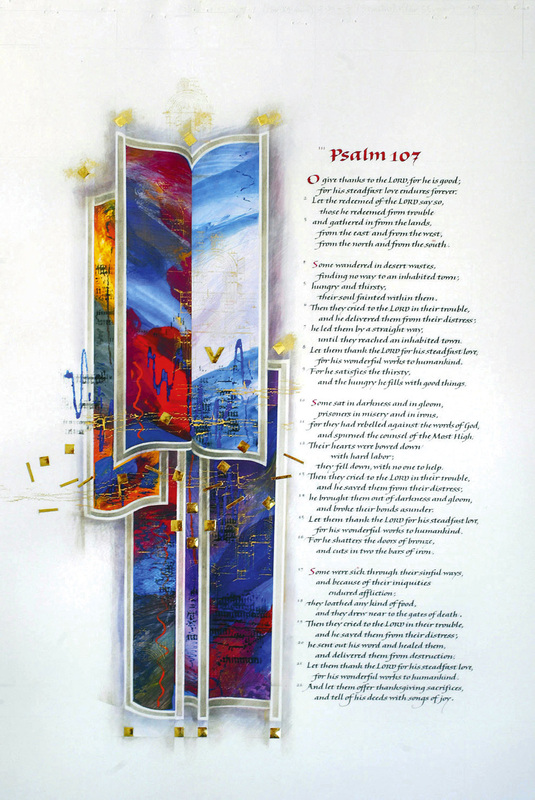 Bibles may include added materials to help you understand the text better, including maps of biblical regions, time lines, dictionaries, listings of the readings used at Mass, and devotional materials. A particular edition may be targeted to young people, moms, or married couples, providing articles and prayers to enrich your spiritual life. A given translation will be identical no matter which edition you choose. If you pick your translation first, you’ll have a text you can rely on, no matter what other features you seek. Mary Elizabeth Sperry is the Associate Director for USCCB Permissions and NAB Utilization at USCCB Publishing. She serves as staff to the Confraternity of Christian Doctrine which is responsible for the development, publication, and distribution of the New American Bible and the promotion of biblical literacy. 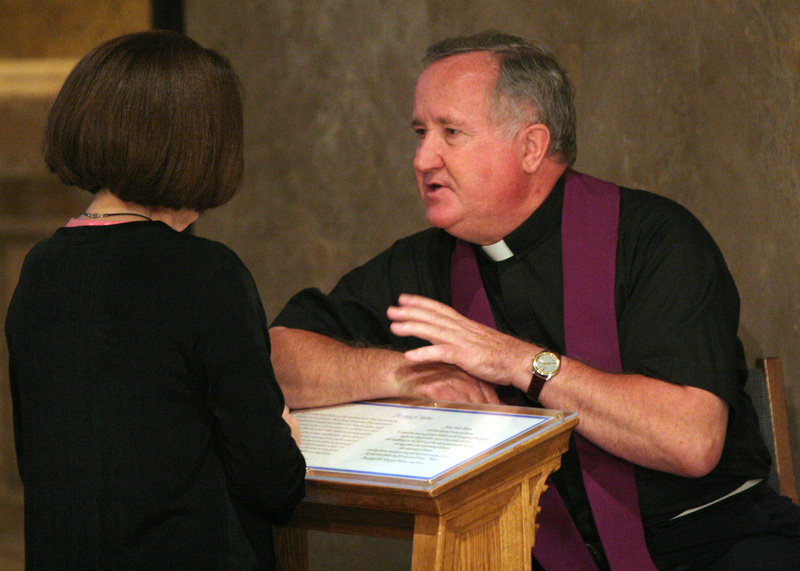 Tuesday and Wednesday are Confession days in much in Springfield. That’s the message we at Our Lady of the Sacred Heart (OLSH) Parish and St. Jude Mission are trying to promote in our surrounding communities. 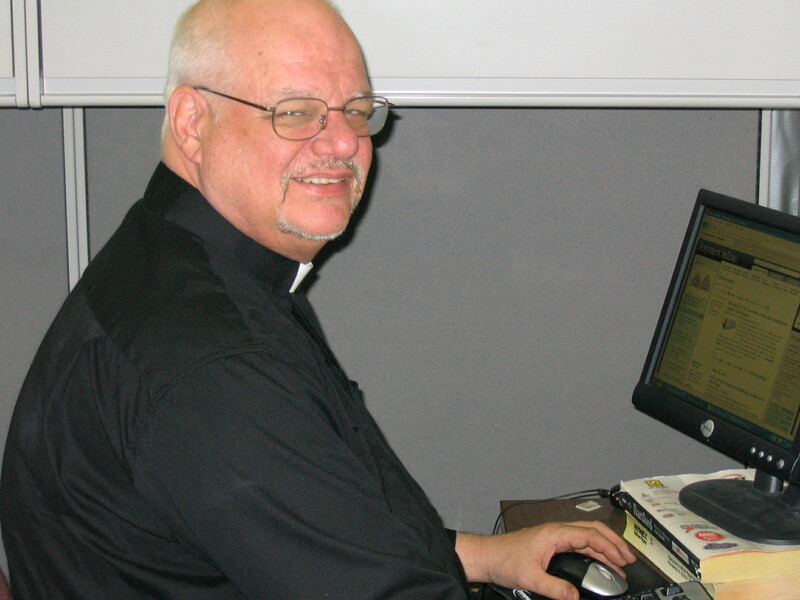 When the newly-ordained Father Tomasz Parzynski joined our clerical team here at OLSH-St. Jude last summer, I started to think, “Why not, as an experiment, build on the success we had with the Wednesday night Reconciliation hours during Lent? Luckily, our rectory also houses a third priest, Father Paul Archambault, a chaplain at Baystate Medical Center who also assists with the weekend liturgies at St. Mary Parish in Hampden. Father Paul also celebrates the First Friday and First Saturday Masses here at OLSH, and has also had some success with a Tuesday evening prayer hour from 6 to 7 p.m. in our parish chapel. Each week about15 to 20 people, a loyal congregation, pray various devotions, which Father Paul introduces on a rotating basis. 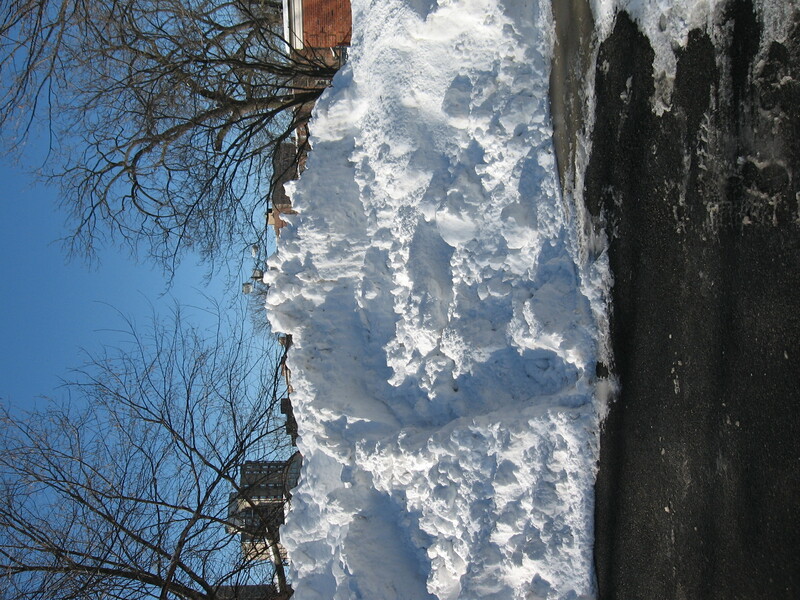 During Advent, we moved the devotions from our Rosewell Street chapel to our main church on Boston Road, and scheduled a priest to hear confessions in English until 7:30 p.m. (After Christmas, we returned the evening confessions to our chapel to make maneuvering through the snow banks easier). Meanwhile, we scheduled an hour of confession, in English or Spanish, at our mission church on Main Street in Indian Orchard from 6 to 7 p.m. Finally, we added mid-day reconciliation hours from noon to 2 p.m. on Tuesdays. The impact was immediate, and powerful. No, we haven’t had hundreds of people lining up on Boston Road and Main Street in Indian Orchard clamoring to confess when we open our churches. But we have had a steady stream of penitents, making our experiment justified. 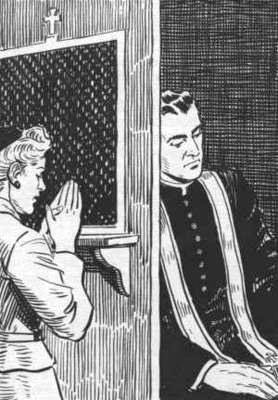 Canon law, of course, prohibits priests from talking about the content of any confession. But I can say that we have spoken to a number of persons who have not participated in the Sacrament of Reconciliation for months, if not years. 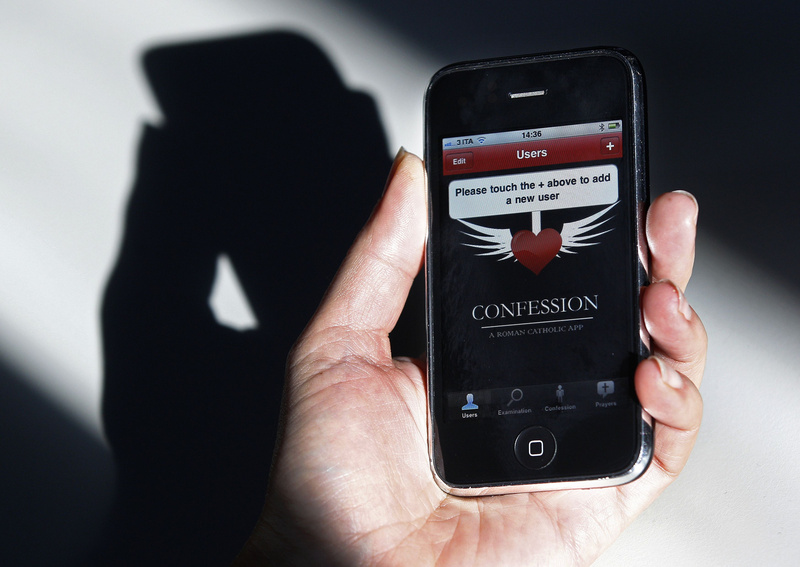 A few weeks ago, the Vatican announced that it was sponsoring a cell phone “app” that guides potential penitents through the confession ritual. I was asked about this at a parish council meeting, and explained that some news account that erroneously implied that Rome was on the verge of promoting confessions by text. We had a good laugh about this, but I reminded my council members that, in fact, apps, printed pamphlets or any other means we can use to make confession less intimidating for folks is a good idea. The days are long gone when Saturday afternoons are reserved for confessions by most Catholic families. And while there are exceptions across the diocese, the “traditional” communal penance service on a weekday evening or Sunday afternoon also seems to be losing its popularity. 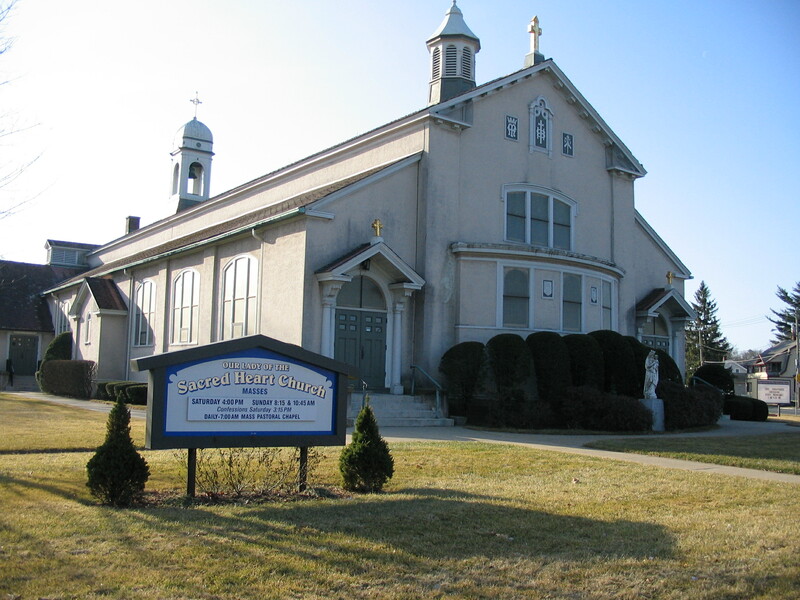 Our Lady of the Sacred Heart is strategically located on a busy commercial street. (I habitually ask, “Do you know how to get to the Eastfield Mall?” when giving directions to our church). 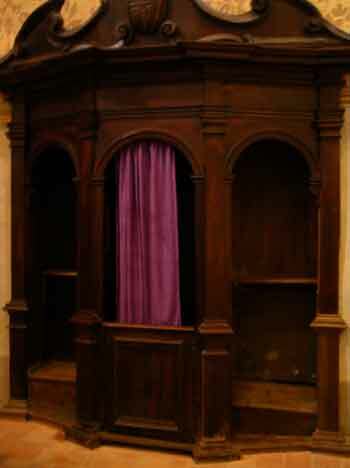 This gives us a unique opportunity to promote “drive-in” confessions by penitents from several different parishes, or no parish. Beginning Tuesday, March 15, we are returning our Tuesday evening devotions and confessions to our Boston Road Church for the Lenten Season. 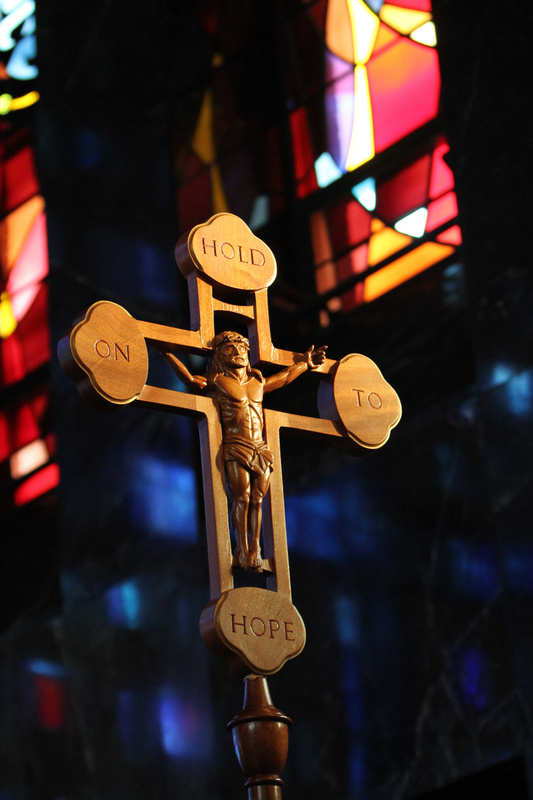 Our neighbors, St. Catherine of Siena Church on Parker Street, will offer Wednesday evening confessions from 6:30 to 7:30 p.m. during Lent. These hours, which we have agreed to mutually promote, replace our traditional, one-time only communal penance service. Finally, the Franciscans of the Primitive Observance, an ascetic religious order who will conduct a parish mission at OLSH March 12-18, will help us staff a “Confess-a-thon” on Tuesday, March 15 from 7:30 a.m. to 8:00 p.m. Spread the word! Your sins can easily be downloaded to a priest, and uploaded to God, in Springfield these days.